Karol Rédli’s The Visit. Photo: Divadli Lab. 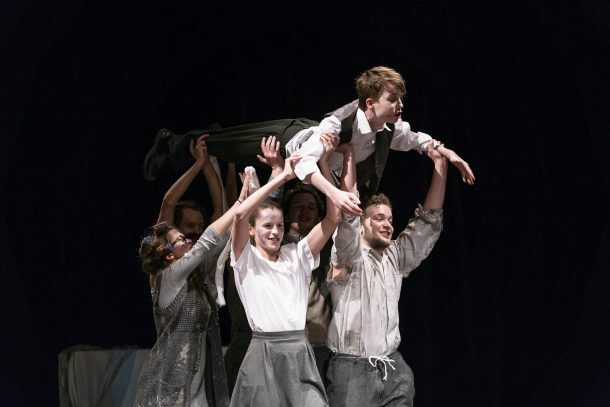 Theatre schools came to the city of Brno for the twenty-eighth time to showcase their work. The slogan or theme for 2018 was “losing ground,” an appropriately, allotted foreground to absurd shows. Or, to simplify it: since reality no longer has a firm grip on reality, how—and why—present theatre as stable? The schools selected to participate in the Setkání/Encounter festival were not all academic ones, where future actors, dramaturgs, and directors study together. Some educate actors only. This translated into an absence of directing and of directors, many of whom had chosen not to journey to the Czech Republic. Or, as theatre fashions go, this may mean that actors are getting an upper-hand over directors, whose reign has unquestionably lasted a long time. By absence of directing I mean that some shows were put together by “the collective.” Judging by the festival’s feedback discussions the morning after, a widespread method of teaching is to give students a free hand to create something, anything. It must be understood that these most often produce in-school material, but at times the results are good enough to merit performances to the general public, and even an invitation to Brno. A possible conclusion from this would be that the method really works, even though on first hearing it, it sounds more like neglect. Three hours east from Prague, Brno is a suitable location for experiencing the absurd. Its celebrated art nouveau buildings are pierced with arcades and gateways that lead to mini-malls, to churches, to building renovation sites, and even to a theatre (HaDivadlo). Menus and signposts are in Czech only. It is no trouble at all to feel lost. On the other hand, a major consolation is that no video screens were used in the performances I saw: Setkání was all about human contact. I chanced upon two kinds of productions: those with two actors, and those with up to a dozen performers, the latter arriving, predictably, from nearby countries. Friedrich Dürrenmatt’s The Visit (Die Besuch der alten Dame, 1956) came from neighbouring Slovakia, from its Academy of Performing Arts in Bratislava. Karol Rédli’s direction combines the hilarious with the outrageous. Actors indulge in Eastern European stereotypes of laziness, greed, and filth. The fun from the stage is contagious: stylish exaggeration has a hold on me. The costumes, by Daša Veselovska, mix nostalgia with a shudder. When the villagers get a hold of some money, the costumes become gaudy but never let go of their appealing vulgarity. All of this brings to mind The Government Inspector by the Latvian director Alvis Hermanis (2002), where bribes were given over the partition of a filthy Soviet toilet. With Hermanis as well as with Rédli, endearingly depicted stereotypes, seen from within, are far from culturally insulting clichés but turn into a subtle criticism of the values in the host society. In Rédli’s version, slovenliness is not only visible, not only psychological, but also political. This Visit bears a moral resemblance to the Polish playwright Tadeusz Slobodzianek’s Our Class (Nasza klasa, 2008), which tells the story of 1930s schoolchildren harassing their Jewish classmates and how the classmates retaliated after the war. Group spirit is turned into mass frenzy. Still, the young Slovak actors are able to maintain our sympathy—not because they want us to like them in spite of their characters committing evil acts, but because they want to show how each character justifies his deeds to himself. May I prophesy that Michal Kinik is an actor to look for in the future; here he plays the village police officer with his moustache and his paunch literally hovering in the air in front of him, his gestures at once cordial and callous. Adam Skala’s The Grab. Photo: Disk. The Czech Egon Bondy (1930-2007), a pen-name, is perhaps best remembered for his lyrics for the underground band, Plastic People of the Universe, under socialist regime. Adam Skala and Kamila Krbcova adapted Bondy’s play Minister of Nutrition (Ministryne vyživy, 1970) as The Grab for the Academy of Music and Performing Arts in Prague. The Grab is a sci-fi vision of how mankind will tackle the food shortage; not surprisingly, we will eat the meat of those killed in war. The future will offer nutritional variety, because in an alternative scheme, a scientist develops human excrement into foodstuff. He works not only in his lab but also with magic, by scratching a crucifix into his brown dough. As an aside I must remind you that reality often possesses more imagination than science fiction can ever achieve. Thus, astronauts drink recycled water during space flights, and Soviet Gulag escapees took along into the forests Taiga, a fat fellow prisoner, as a fresh meat reserve; Bondy would have been aware of the latter. Now back to the play: food problem solved, mankind is free to concentrate on issues of importance such as who loves whom. The rulers of the country have capricious sexual appetites, which have led the director Adam Skala to a frolicking grotesque treatment. In the morning discussion Skala’s actors said they were instructed to behave as cartoon characters. It works well save for the moments when the tempo slows down to—for lack of a better word—serious exchanges of sincerity. This was Skala’s second work as a playwright. With plenty of actors on stage, even though they manage to kill many characters in the course of the action, toward the end of the second hour, rather inevitably, two characters begin an ironically metatheatrical discussion of how to bring all this to a close. Christian von Treskow’s It’s not that way, it’s over here. Photo: APA Baden-Wurttenberg. 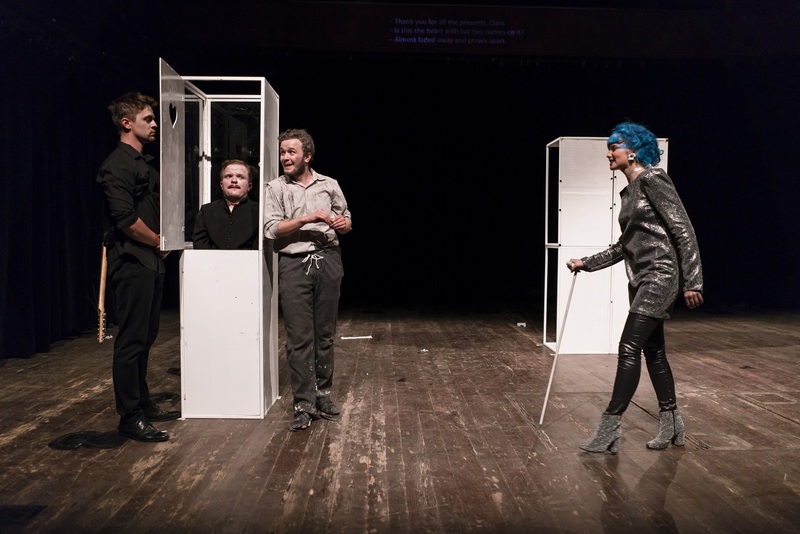 The Academy of Performing Arts Baden-Württenberg (ADK) from Germany gave us stylish excerpts from Eugène Ionesco under the heading It’s not that way, it’s over here. Ionesco’s The Bald Soprano and other one-act plays are glued together by both director Christian von Treskow and Tony De Maeyer, who guides the actors into Meyerhold’s biomechanics. The actors had plunged into Ionesco with movement and only added dialogue two weeks into rehearsals. They had rehearsed in small groups, whose creations were shown to co-actors just a week before the premiere. In the morning discussion the Ludwigsburgians said that since the absurd Ionescians lack all psychology, theirs was an appropriate way of preparing the production. No objection, but when the psychological dimension is denied, the characters do not react much when their partners take sudden leaps or jerks. Let it be biomechanics then, or perhaps choreography is a more accurate word, since the actors know what to expect. Curiously enough in a festival of actors, the morning discussions concentrated more on content, even on moral content, than on acting techniques. Noc Helvera. Photo: Teatr Olszlyn. 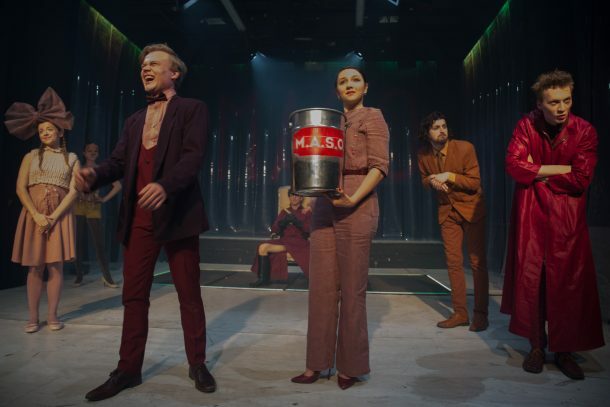 The Russian production Night of Gelver had been quietly boiling in the minds of its two actors for eighteen months before it premiered, and the time devoted to the fine-tuning of psychology certainly showed in the result. The Polish Ingmar Villqist’s Noc Helvera (1999) was adapted by the two actors, Nadezhda Filippova and Stanislav Burov of Yaroslavl Theatre Institute, and directed by “the collective.” By adaptation I mean a cautious russification; perhaps it is best to leave it to the spectator to make a connection—if any—between historical Nazism and its contemporary Russian manifestations. This led to the production being curiously undecided about the era. According to Villqist this is the 1930s, but before any action starts we are treated to no less than five different bits of music, for example “A Man without Love,” the 1968 (originally Italian) hit, this time as a German recording. In the morning discussion I learned that recordings from the 1930s were of bad quality, which explains the time jump, but only in hindsight. During the performance I interpreted it as lack of directing, which narrows the production down to psychological realism, and that, of course, is a field where Russian actors have a habit of excelling. It is heart-breaking to read in the festival catalogue that the Yaroslavl institute trains artists “for the Russian provinces;” many a capital would surely benefit from the inner beauty of the Yaroslavl kind. But Noc Helvera never manages to grow beyond the beauty of individual gestures. The mentally challenged Nazi boy and his adopted mother are finely chiselled in their bouts of despair, and the first occurrence of physical violence is really startling, but what is all this about as an artistic thesis? Christopher Weare’s The Island. Photo: AFDA. 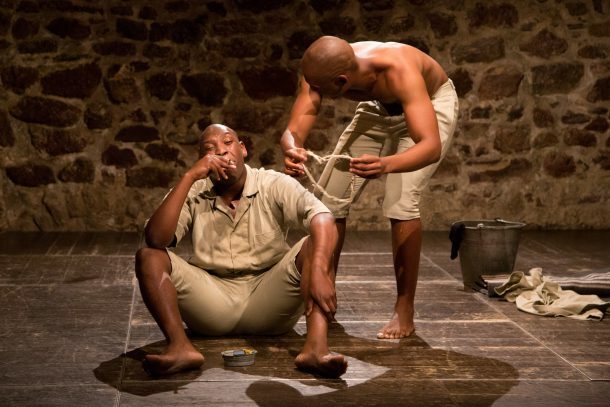 The Island is an apartheid-era (1973) South African play by Athol Fugard and its two actors, John Kani and Winston Ntshona. In Brno The Island was performed by students of AFDA from Cape Town (The South African School of Motion Picture Medium and Live Performance). 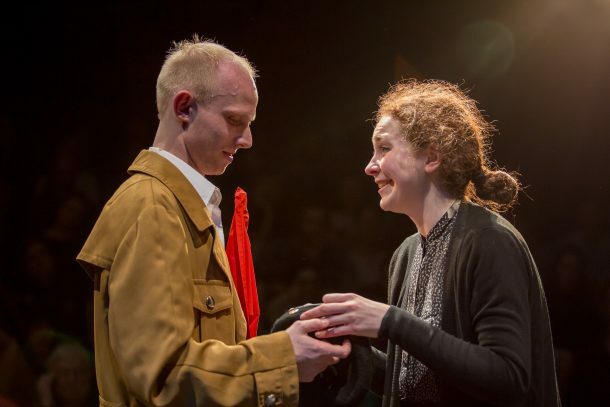 I cannot find the names of the two actors either in the written materials provided by the festival, or on the festival webpage; there isn’t any mention of the production on the homepage of their school either. Organizing the Setkání Festival is a part of the studies in the arts management program of The Janačék Academy of Music and Performing Arts in Brno. This means that every year the organizing team renews itself, as former students graduate and leave Setkání. I am sure that every measure is taken to ensure continuity, but inexperience may cause some clumsiness. 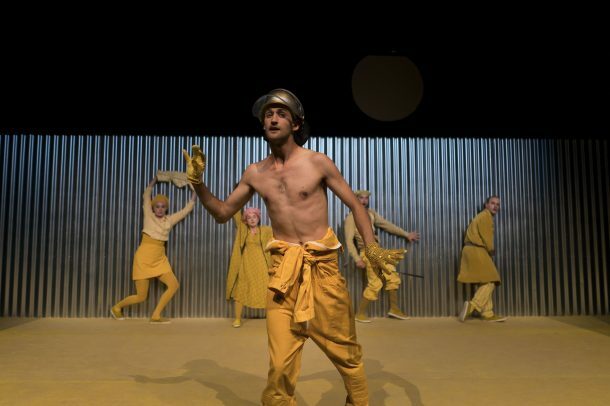 The Island, performed in the small, cave-like space of Divadlo U stolu, attracted audiences and was given extra showings, which it certainly deserved. Over the years Setkání has given up its competitive nature, and today’s awards are given in recognition of talent, not for superiority over other participants. And here, in the citation of the festival director’s award, the names appear: Luntu Masiza with his fellow actor Siabonga Mayola expressed “significant ethic insight into totalitarian tendencies and racism within the society in broader context.” The two cell-mates toil at punitive meaningless work, and take refuge both in their imagination and in memories, and in creating an artwork, a theatre performance for their fellow inmates. The actors depict the innocence and ignorance of isolation. I began this review by maintaining that reality is out of fashion. The Island shows just how strongly reality hits back at such absurd claims, and the festival director’s award recognizes the merits of artists facing this with intelligence and integrity. Matti Linnavuori (Helsinki, Finland) is the editor of performance reviews with Critical Stages, which is the webjournal of the International Association of Theatre Critics. He wrote theatre reviews for various newspapers and periodicals in Finland from 1978 to 2013. In 1985, he worked in London at the BBC World Service in the Finnish language broadcasts. In the 2000s he contributed to Teatra Vestnesis in Latvia. Since 1992 he has written and directed several radio plays for YLE the Finnish Broadcasting Company. His bilingual stage play Ta mig till er ledare (Take me to your leader) was produced at Lilla teatern in Helsinki in 2016.